Are your sets getting stale? Looking for an extra kick to get the crowd moving? You've found it. The AS-15BLU-LT from Gemini is the refresher your kit needs. Give your performances powerful sound and a brilliant LED lightshow dynamic enough to eliminate any need for extra external lighting fixtures and sure to pump up the crowd at any small/medium sized events. Don't underestimate this speaker; it's not easy being really, really ridiculously good-looking. 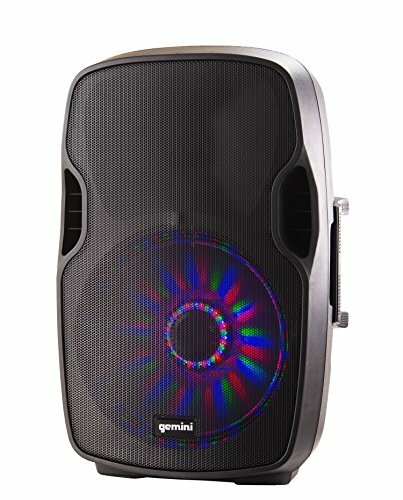 This vibrant, perfectly beat-synced full-color LED lightshow is just the surface of what this what this speaker can do. With the 15" woofers with 2" voice coils, high-power, 2000W peak Class AB built-in amplifier, this active PA speaker has an integrated MP3 player with industry standard USB, SD and Bluetooth connections. You'll never be left to question how smoothly your set will go. Get the added bonus of a lightweight, ABS impact-resistant nylon fiber cabinet featuring top and side handles for easy and fast transport and set-up. Get high professional quality equipment without the high professional price tag. The AS-15BLU-LT pumps deep roomy bass and true linear sound to your crowd and get bodies moving without breaking the bank. Reliable, durable with a sleek design, this makes a perfect addition to any kit and occasion. Including a built-in FM radio with internal antenna and standard mic and line XLR, 1/4”, 1/8”, and RCA inputs, get the most from your speaker and worry less with its flyable and stand-mountable capabilities. Grab it while you can! At Gemini, our goal is to design products that offer value and innovation in the DJ and Pro Audio markets. Since 1974, we’ve evolved and thrived by understanding the needs of our customers and recognizing industry trends. From our humble beginnings, we understood the potential of the DJ movement, and our ability to support this movement not only helped us grow as a company, it helped DJs gain recognition and esteem, calling deserved attention to their roles as artists and performers.